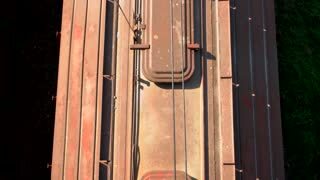 Search Results for "train railroad top view vertical"
02. 08. 2017, Odessa, Ukraine. Driving freight cargo trains with cargo. Top view. Close up. Top view train wagons. Freight train rides by rail, transports laden wagons. Aerial view of freight trains on the railway station. Wagons with goods on railroad. Heavy industry. Cargo trains. Industrial conceptual scene with trains. Top view. 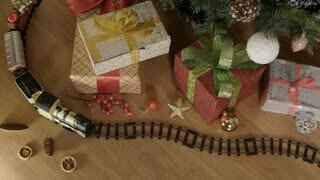 Railroad track top view. Aerial view of train with containers standing at the railroad in winter time. Flying over countryside on a cold snowy winter day. Logistics, transportation industry concept. 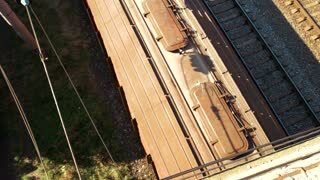 AERIAL TOP DOWN: Flying above empty cargo train moving past freight containers at industrial railroad station on sunny day. 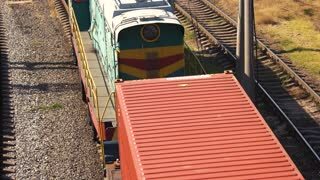 Empty railroads and export container trains on industrial railway terminal. Aerial view of railway bridge over the river. Railroad. Heavy industry. Industrial conceptual scene. Top view. Aerial view of two railway bridges over the river. Railroad. Heavy industry. Industrial conceptual scene. Top view. Railroad track top view on a sunny day. Aerial view of empty railroad in winter time. Flying over industrial zone in the countryside on a cold snowy winter day. Freight,logistics industry concept. Railroad track top view. Aerial view of empty railroad in winter time. Flying over countryside on a cold snowy winter day. Freight and logistics concept. Railroad track top view. 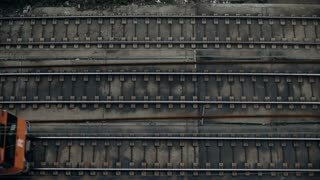 Aerial view of empty railroad in winter time. Flying over countryside on a cold snowy winter day. Carriages with coal go on a railroad, top view. Top view or aerial shot from drone of railroad or railway among winter forest in snow. Depot metro, top view of departing passenger subway train on railroad.